First top and tail the gooseberries. Tie 2 or 3 elderflower heads in a little square of muslin, put in a stainless steel or enamelled saucepan, add the sugar, and cover with cold water. Bring slowly to a boil and continue to boil for 2 minutes. 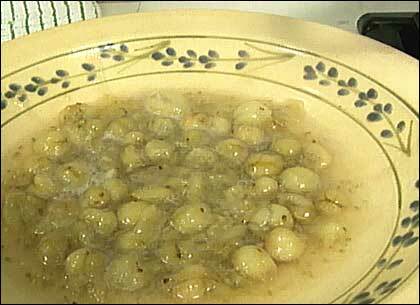 Add the gooseberries and simmer just until the fruit bursts. Allow to get cold. Serve in a pretty bowl and decorate with fresh elderflowers. Liquidise the compote and mix with softly whipped cream to taste — about 2 volumes of whipped cream to fruit purée. Serve chilled with shortbread biscuits. Chef Darina Allen notes: When I'm driving through country lanes in late May or early June, suddenly I spy the elderflower coming into bloom. Then I know it's time to go and search gooseberry bushes for the hard, green fruit, far too under-ripe at that stage to eat raw, but wonderful cooked in tarts or fools or in this delicious compote. Elderflowers have an extraordinary affinity with green gooseberries and by a happy arrangement of nature they are both in season at the same time. This segment appears in show #3114.